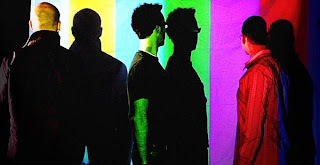 Local electro-tinged indie pop band Helicopters are releasing a special "Digital Bonus Version" of their latest record, Sizing up the Distance (reviewed here), and to celebrate are set to play a free release show Tuesday, May 5 at Double Door. The May 5 show will also feature Love In October, Save Pointe and Bob Nanna & Lauren Lo. Doors open at 7 and the show starts at 8.